The Passover of the Jews was near, and Jesus went up to Jerusalem. In the temple he found people selling cattle, sheep, and doves, and the money changers seated at their tables. Making a whip of cords, he drove all of them out of the temple, both the sheep and the cattle. He also poured out the coins of the money changers and overturned their tables.He told those who were selling the doves, “Take these things out of here! Stop making my Father’s house a marketplace!” His disciples remembered that it was written, “Zeal for your house will consume me.”The Jews then said to him, “What sign can you show us for doing this?”Jesus answered them, “Destroy this temple, and in three days I will raise it up.” The Jews then said, “This temple has been under construction for forty-six years, and will you raise it up in three days?” But he was speaking of the temple of his body. After he was raised from the dead, his disciples remembered that he had said this; and they believed the scripture and the word that Jesus had spoken. My sermon from Third Sunday in Lent (March 4, 2018) on John 2:13-22. Listen to the recording below or read my manuscript below. What’s the largest animal you’ve ever transported? I don’t have an interesting answer to this question. The only “large” animals I’ve ever transported were cats. When I first moved to New York City, I lived with a 20 lb cat named Indiana Jones. He hated car rides and wasn’t thrilled leaving Ithaca, New York at 2 am in the morning for the 5 hour drive into Manhattan. He was mad during the entire journey. But I didn’t need to do anything special to transport him the 230 miles to his new home. I don’t know how to transport a large animal but I can imagine what it might be like. Today, when I think about moving a large animal, my mind dreams up horse trailers. As I drive behind them, it seems like the horses in that metal tin can are always a bit content. Their tails swish back and forth as they stand in their metal enclosure zooming down the highway at sixty five miles an hour. I imagine this kind of setup could be used to move all sorts of animals like cattle, cows, and sheep. If all of us were farmers and we raised our own animals, we would know exactly what it takes to move animals over a large distance. But if we were living 2000 years ago, without trucks, highways, and any modern equipment, we might have a different kind of experience trying to move cattle, cows, and lambs. It would take days or weeks to travel even 60 miles. We would need to carry all the food and water we, and the animals, would need on our journey. We would also need to make sure we followed a route that was safe, free of any bandits and robbers, or end up paying for armed guards to protect us as we traveled. And we would finally need to say a lot of prayers, hoping that no storms, floods, or broken legs caused by stepping in potholes would hurt, break, or damage our animals. Moving animals in the ancient world was probably a big pain. And if we only needed to bring a few with us, we would want a system where we didn’t need to bring any animals at all. Instead, we would want to just show up and have the animals right there. This kind of setup would be helpful for farmers who had to travel long distances and would also work for those of us who aren’t farmers at all. Instead of spending all that time, energy, and resources to bring a large animal with us, we could just buy one and save ourselves the trouble. And that also would be helpful, maybe even grace filled, if the animal we needed was there to help our relationship with God. Through the special use of certain animals in the place God declared as holy, the system of sacrifices used in the Temple in Jerusalem was, I think, focused on showing how God actually cares about us. The sacrifices were about more than just trying to cover up any of our sins; they were a sign of our committed to God who is committed to us. A room full of animals ready to offer to God, as described in the gospel according, could easily seen as a holy gift. So if someone walked in with a whip, and drove the cattle, sheep, and everyone out into the street, we might be annoyed, shocked, and angry at what that person just did. Jesus is a bit of a punk in our scene from the gospel today. He’s angry, aggressive, and violent. He scared the people and animals; disrupted everything in the Temple, and sent the cattle and sheep to go rampage in the city streets. We tend to, I think, downplay the emotion displayed in this scene. We highlight the corruption, pointing to the money lenders who were converting Roman coins into the money the Temple used, and were over charging and skimming off the top. We take that corruption, combine it with our belief in Jesus’ meek-and-mild manner, and claim that this scene wasn’t that upsetting. Jesus is angry but not that angry. He doesn’t, we imagine, get as upset as people do. But I’d like to invite all of us to stay in this scene as John described it. It’s supposed to feel emotional. It’s supposed to make us cringe. We need to be shocked by the wildness of Jesus in this moment. Jesus isn’t, I think, flying off the handle. He knew exactly what he was doing. But he’s still disruptive. He’s still emotional. He’s still human. And he clears out the Temple being as angry as any of us can be. Jesus, in this moment, is very human. And he showcased his humanity with his words. He poked those around him by saying he would raise up a temple, restore one of God’s gifts, in only 3 days. The people in that room didn’t see Jesus’ point of view. They focused on the gifts from God they knew. They knew the Temple, its system of sacrifices, and how God made the Temple the place where the divine world and the human world met. 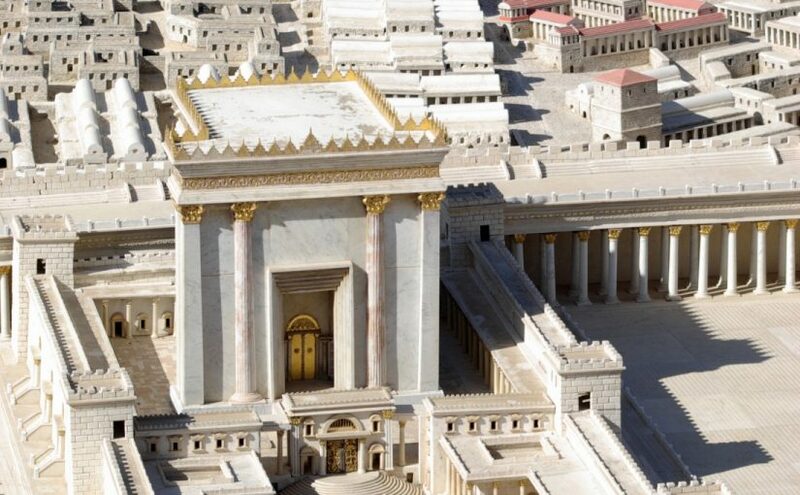 The Temple was more than just a fancy building; it was where God promised to be. You might not see or sense or experience God in your life. But everyone knew that when you entered the Temple, when you brought your gifts of an animal or food or even money, you knew God was right there. The Temple was a gift because it was the place where God’s realness could be experienced and seen. The Jewish people around Jesus knew what God’s gifts looked like. And those gifts for them are still, even today, very real. But Jesus was announcing that for the rest of us, a new gift was being offered. And that gift’s Temple, this new and holy place, was a very human body. Which is odd because bodies are weird. They grow and change and never really stay the same. We can workout and train and get our bodies to do amazing things. But they can also wear out. Or break. Or get sick. It’s difficult, even today, to believe that a body, unique but similar to ours, could be a new and holy place. Jesus, who ate, and sweat, and got tired, and probably even smelled just like we do is the place where God decided to make the divine real. It’s through real hands and real feet that Jesus chose to make himself known. Scripture never tells us if Jesus’ body was perfect. And I believe that we make a mistake if we act as if Jesus never had an upset stomach, or acne, or a stubbed toe. God declared, in Jesus, that the human body, Jesus’ body, and your body – as it is – is a beautiful and divine thing. And it’s through this very human body, with very human needs, and very human emotions, that God chooses to use to adore, cherish, and love the world. I’ve never transported a large animal. I’ve never had to figure out how to carry and move any kind of large body. But I do know that Jesus came to show that God cares about all of us – including our body. Because it’s through bodies that we experience God’s gifts. Our body is how we hear and see and notice the love that God gives us. It’s through our humanness that we notice and live in those places where God comes down to meet us. Our bodies are the place where we experience God’s blessings. And it’s through these bodies, as they are right now, that God uses to bless those around us. Our bodies are not perfect but they are, through our connection with Jesus, a holy place where we feel God and where those around us discover how much God loves them. Because the Jesus who showed the holiness of his body in the Temple, has made each of us, through our baptism, into our own kind of holy place where people can, and will, and must – meet him.